Have you ever wanted more than one dessert at the same time? Okay, silly question. I think a lot of us probably do, right? Well, I know I do. 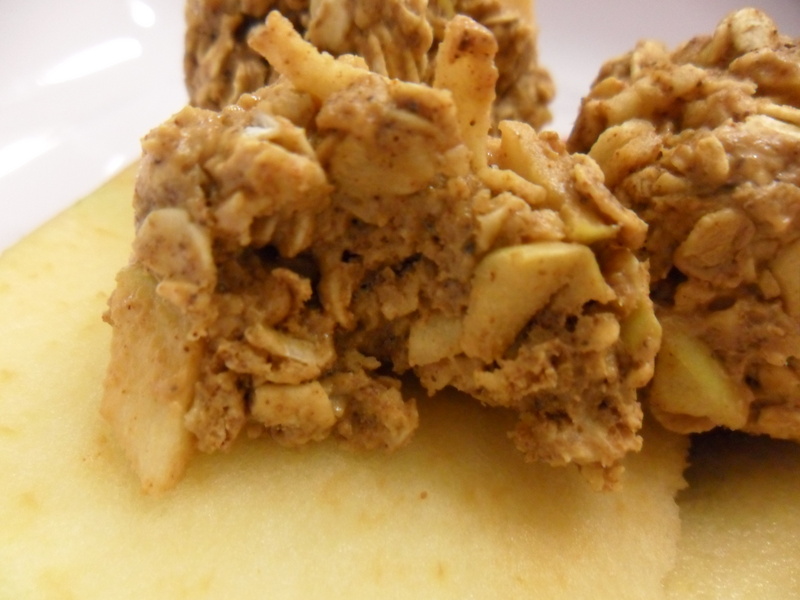 That’s why I really like my healthy & downsized version of Family Kitchen’s Apple Cookies. 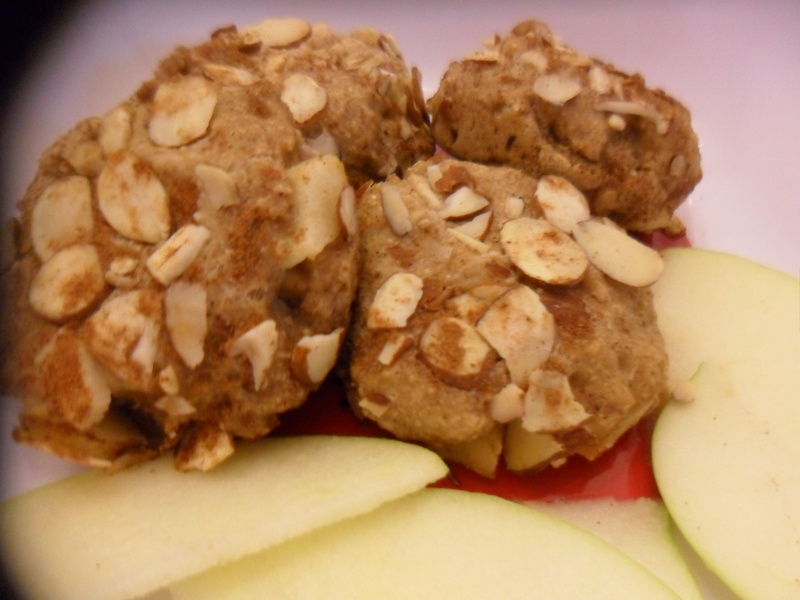 They taste exactly like an apple pie, but in cookie form. And since I’m not a huge fan of fruit pies, this is a sweet breakthrough for me. 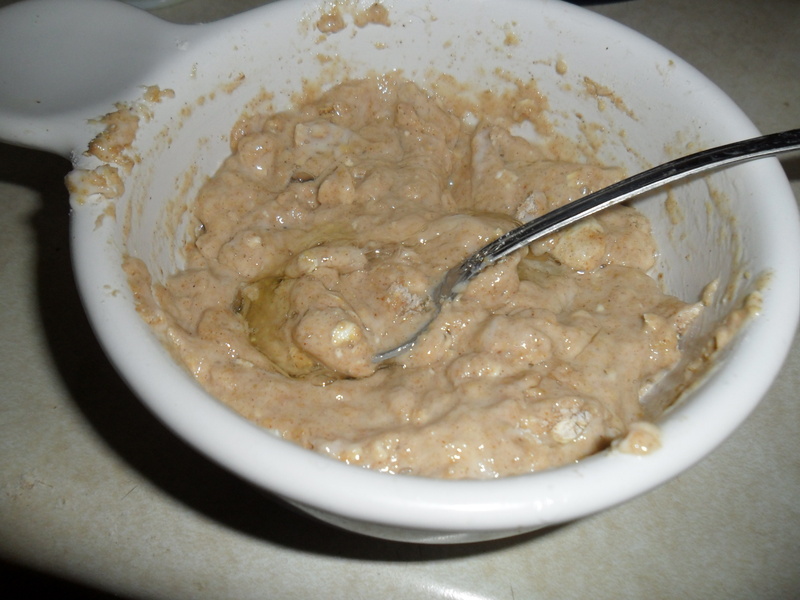 -Combine all dry ingredients well (except nuts). 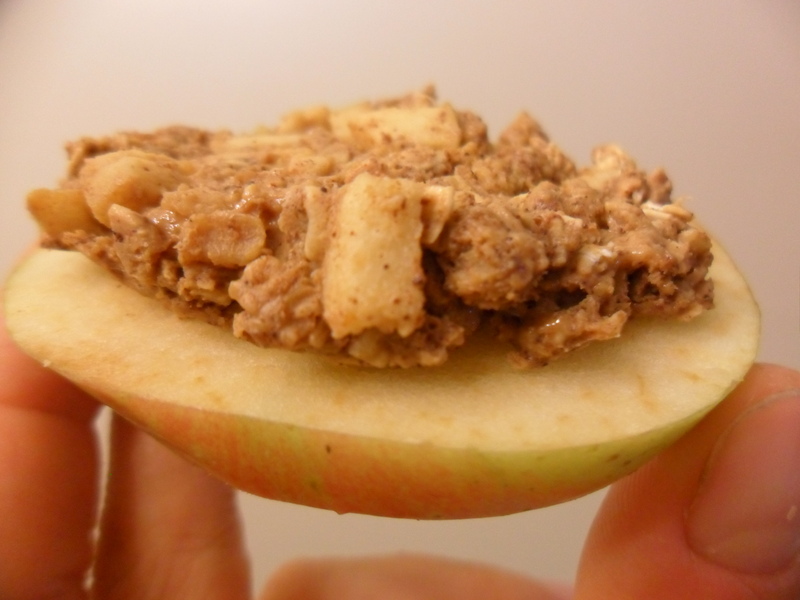 Mix in wet ingredients, mixing in chopped apple last. At this point, if you want your nuts mixed in, do that. I pressed mine on top for garnish (and toasting). -Roll into 4 or more balls. 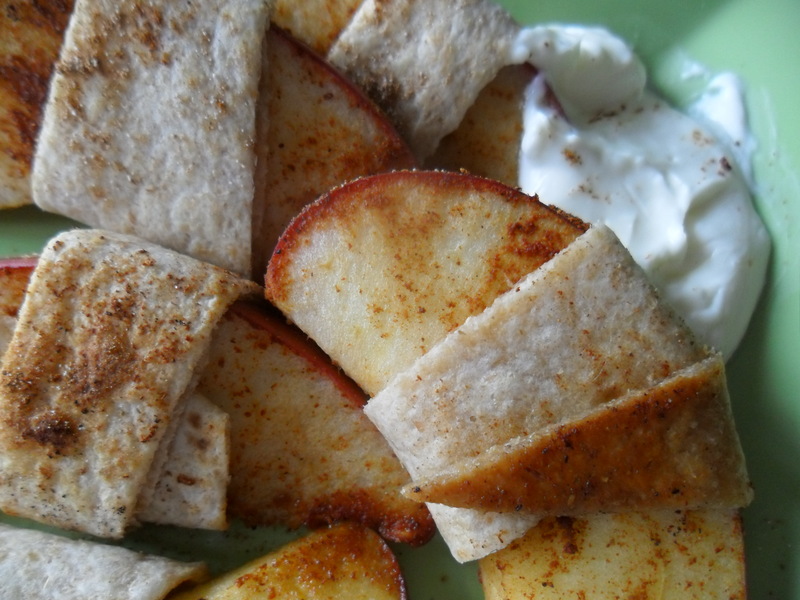 Press lightly onto cookie sheet and bake for 9-10 minutes or until golden brown and fluffy. If yours turn out anything like mine. 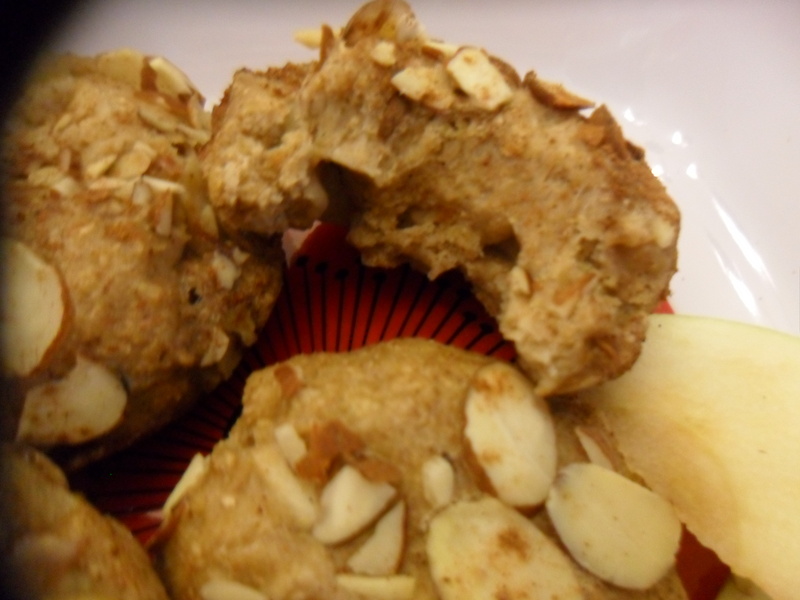 These were quite fluffy–almost like small muffins. Hmm. 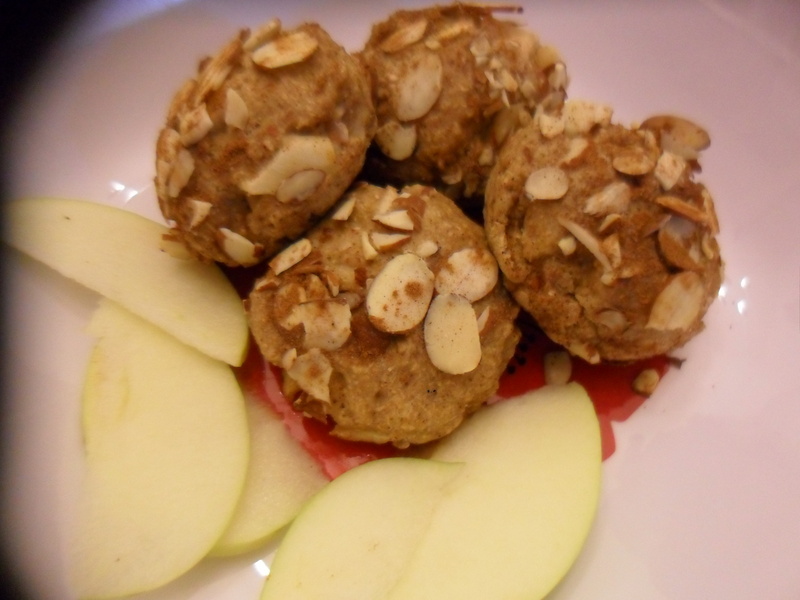 Apple pie muffins? Sounds like another recipe to try. 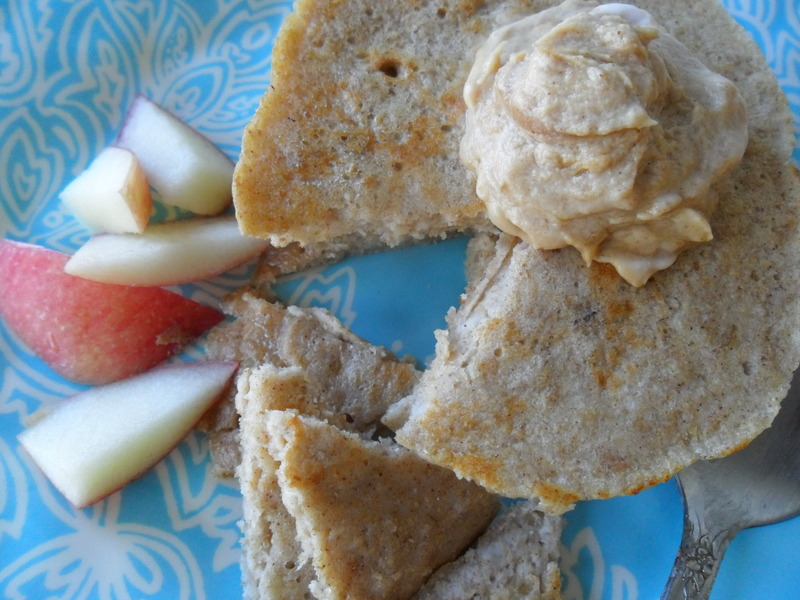 Any women’s health and fitness mag will tell you, the best pre- or post-workout snack features healthy carbs and protein. 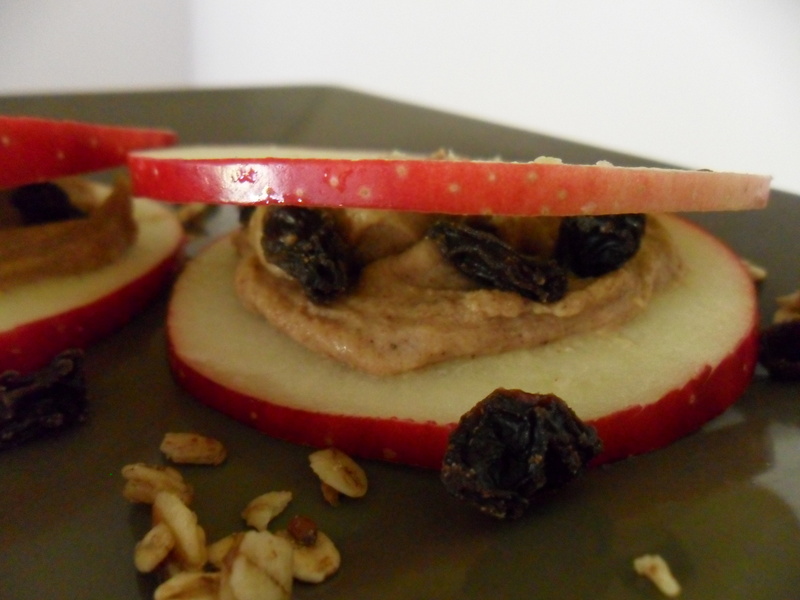 A favorite go-to is the apple-peanut butter combo, but your refueling snack need not be so simple or boring. And make the spread a little fluffier and sweetener. 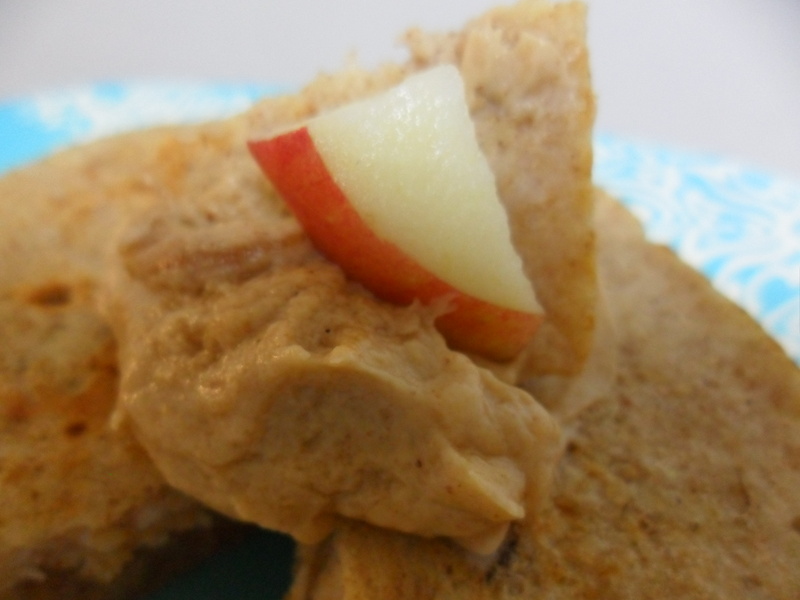 Simply lay out the apple rounds and spread with the nut butter spread, which is just ingredients 2-4 mixed into a smooth, fluffy spread. Top however you like! 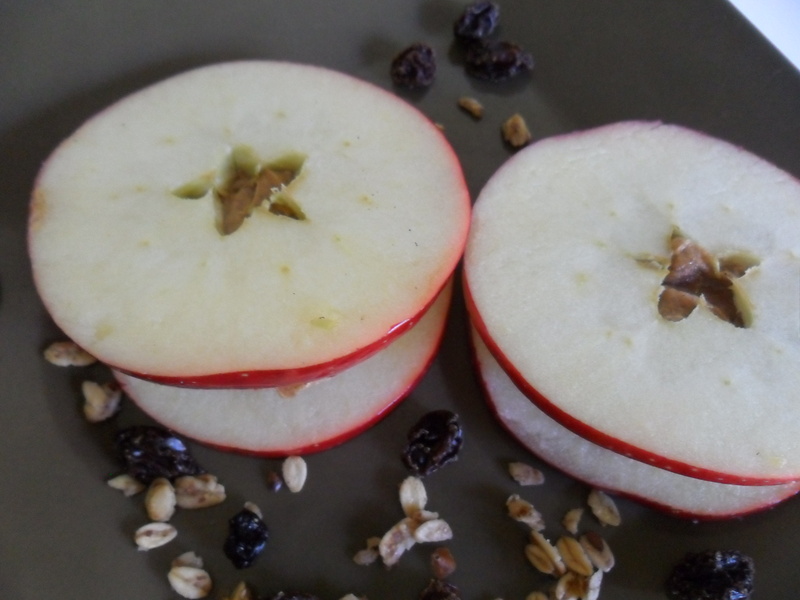 I like my apples sliced so that you can see the star in the middle. 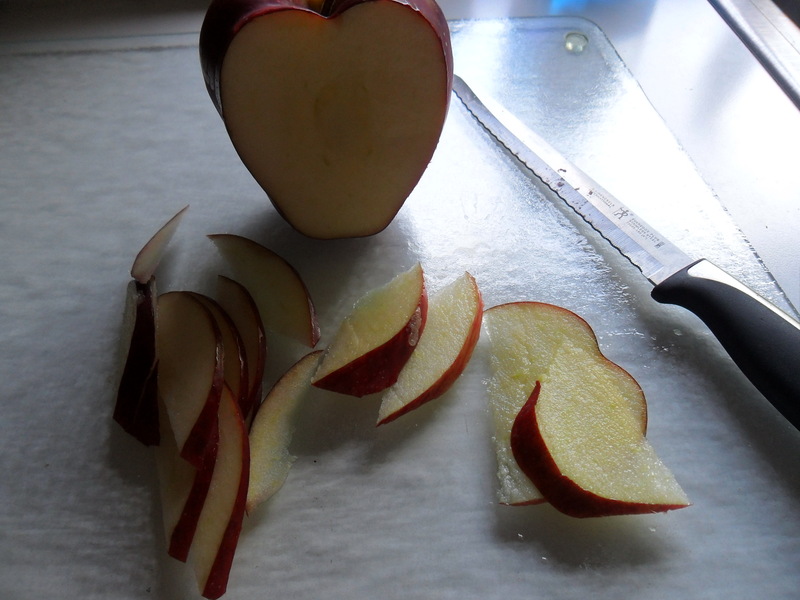 “Did you know it was there?” That’s what my Grandma Betty would always ask when she’d slice my apples this way. Perhaps that’s why I’m sort of partial to this recipe. 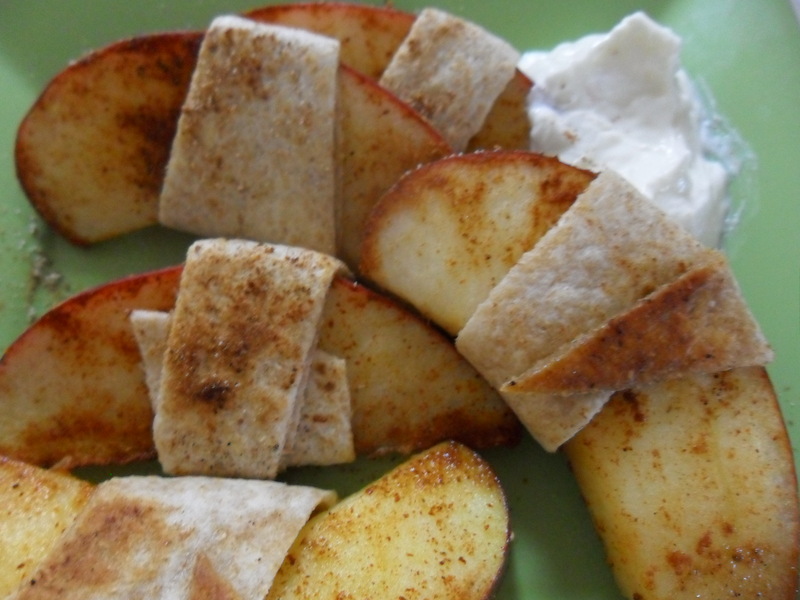 It could also be the fact that the spread also makes a delicious dip for a group! 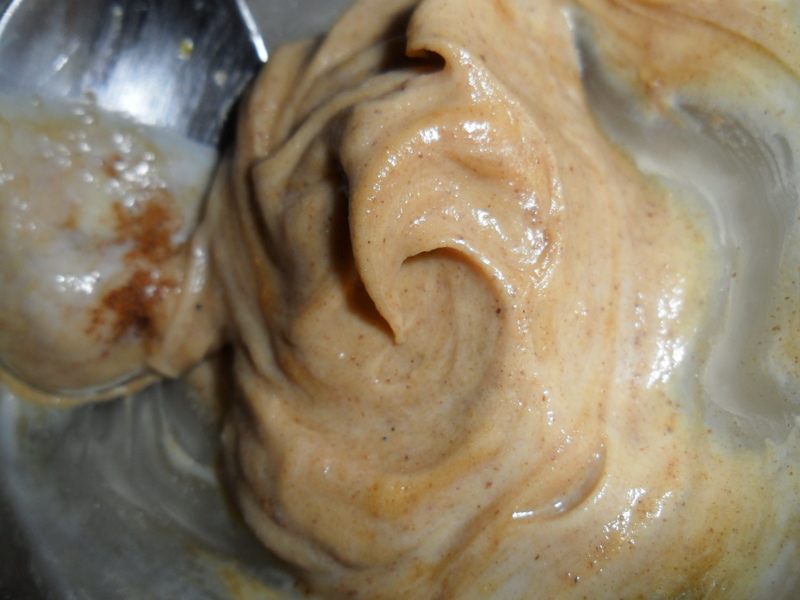 To make enough dip for a group, combine 1 cup peanut butter with 1 cup yogurt and 2 T cinnamon. 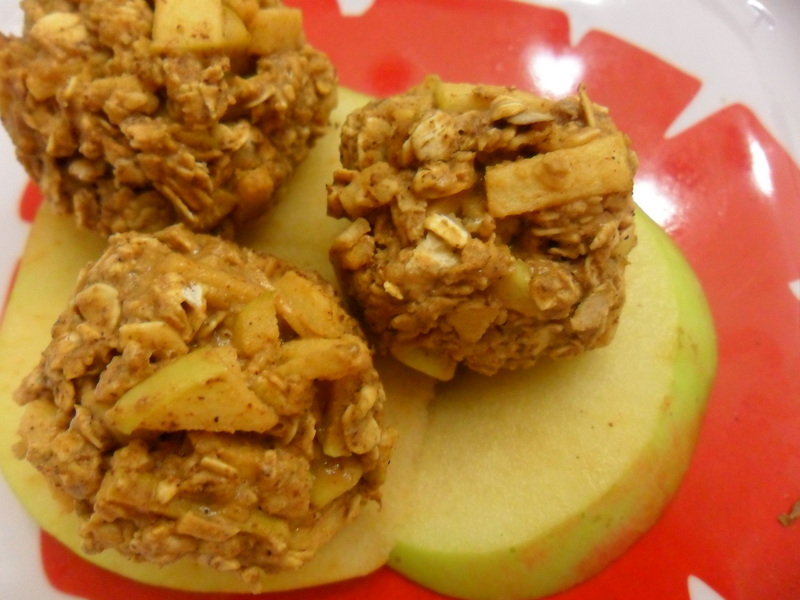 Chill and serve with apples, pears, or banana slices. 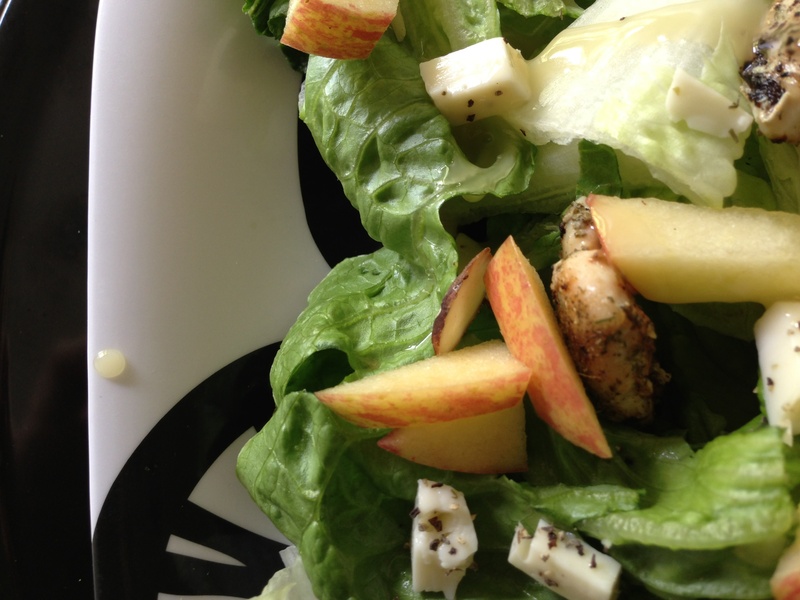 I got this idea from one of my favorite foodie bloggers, Snack Girl. 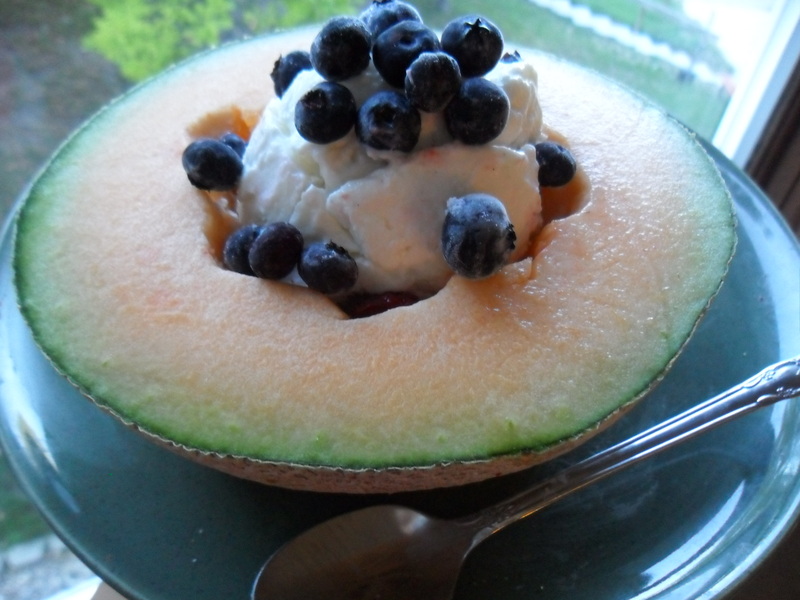 I didn’t make many modifications to her breakfast version of this cantaloupe bowl. 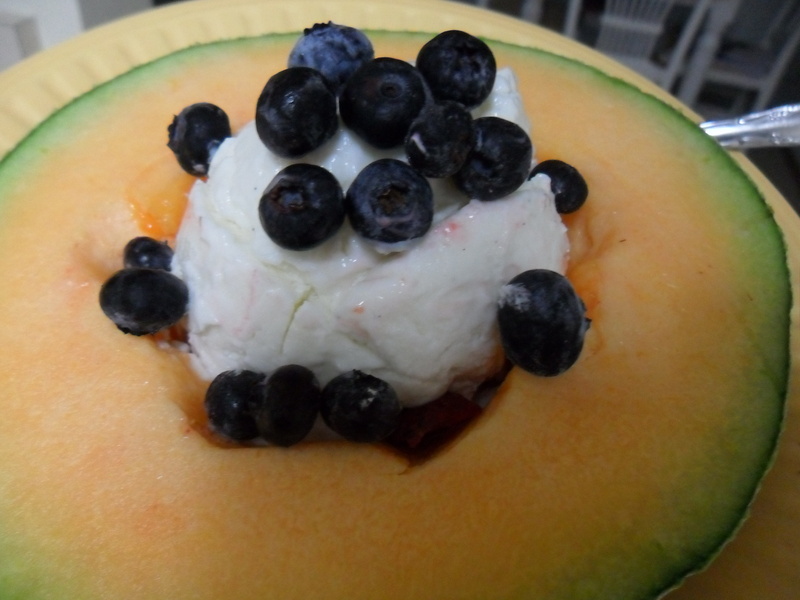 1/2 to 1/3 cantaloupe, filled with your favorite yogurt and topped with blueberries or other fruit. But I have a frozen little secret I’ve been sharing with friends for quite a while that turns this breakfast bowl into a sundae one! 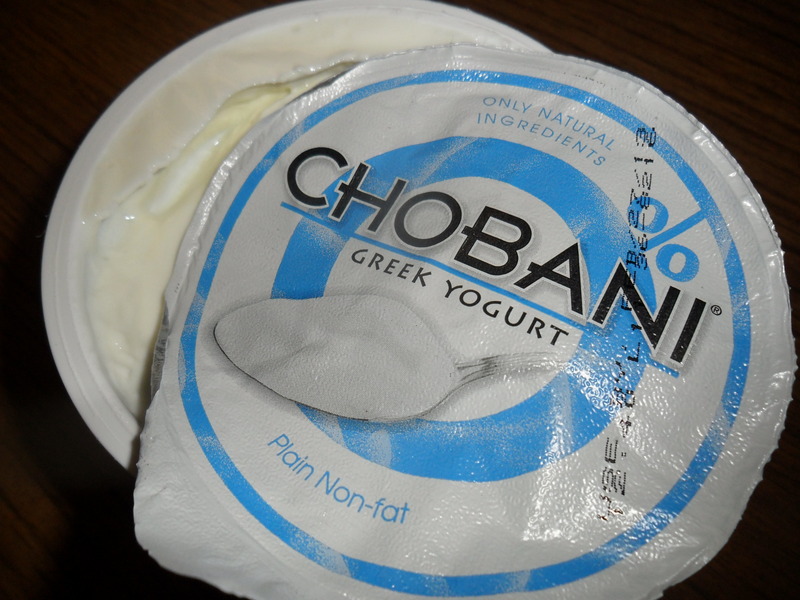 A few nights a week, I pop a cup of Greek yogurt in my freezer, churning it with a spoon every 20 minutes or so until it reaches a frozen consistency similar to ice cream. Pretty smart, right? It’s lower in sugar than most frozen treats you’d buy in store, plus it’s got more protein, too! I often mix in fresh fruit as a topping. Blueberries are a regular feature in this frozen yogurt design. 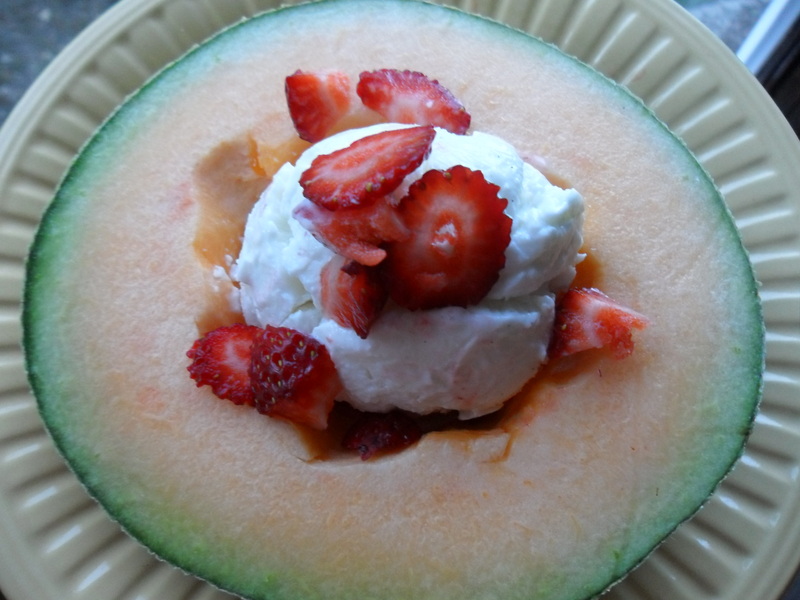 Idea: Freeze the bowl (the cantaloupe bowl), too! Idea: Add in a frozen banana for a real sundae effect. Idea: Freeze into several chunks and mix with frozen fruit in a blender for a smoothie-like consistency. Fruit really does make for a delicious dessert. It’s naturally sweet, naturally the best choice. Fruit and cheese make for the best combination. 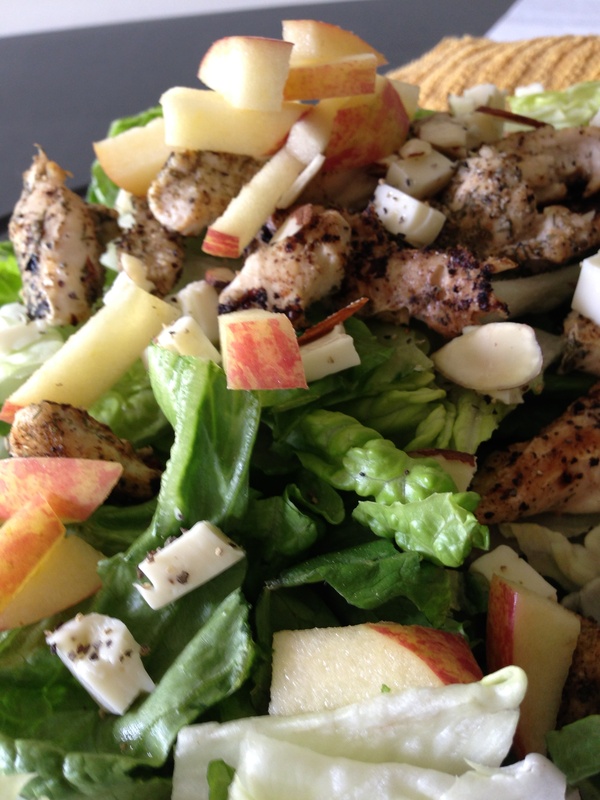 Dessert, dinner, or lunch; it doesn’t matter. Why don’t we think to pair the two more often? I was craving a savory-sweet pairing one weekend afternoon, but it had to be warm and melty, and a boring meat-cheese panini wasn’t going to cut it. 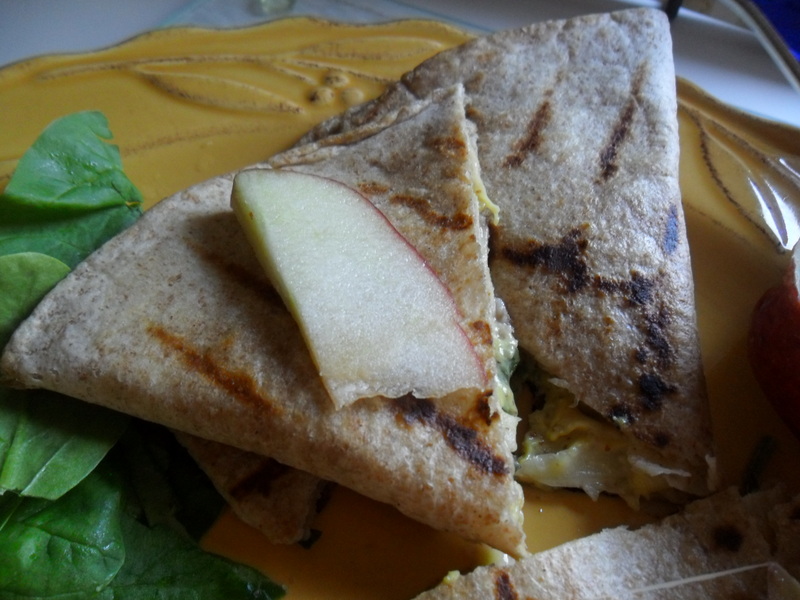 I decided to take a classic fruit-cheese pairing, apple and gouda, and melt them between the folds of a whole-grain tortilla with a little Dijon mustard and seasoning for tasteful flair. 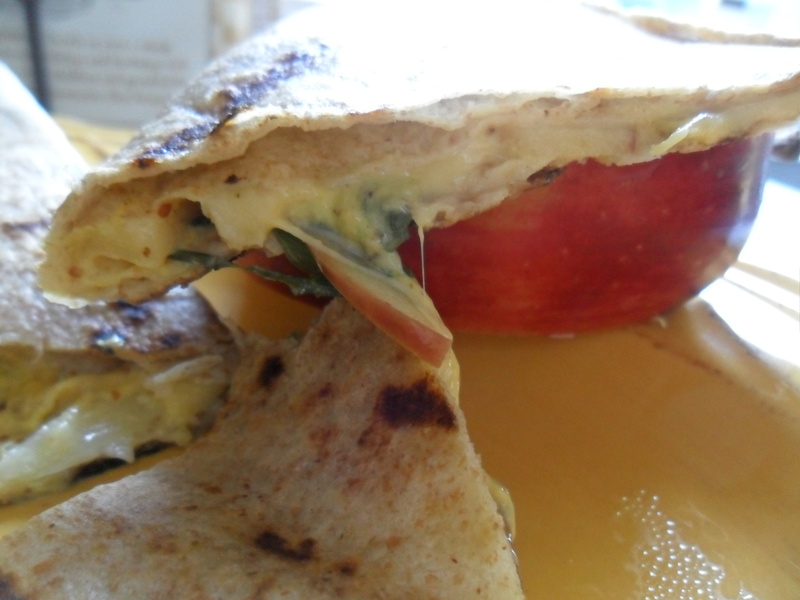 And if you’ve ever made a quesadilla at home, you know how quick and simple it can be. 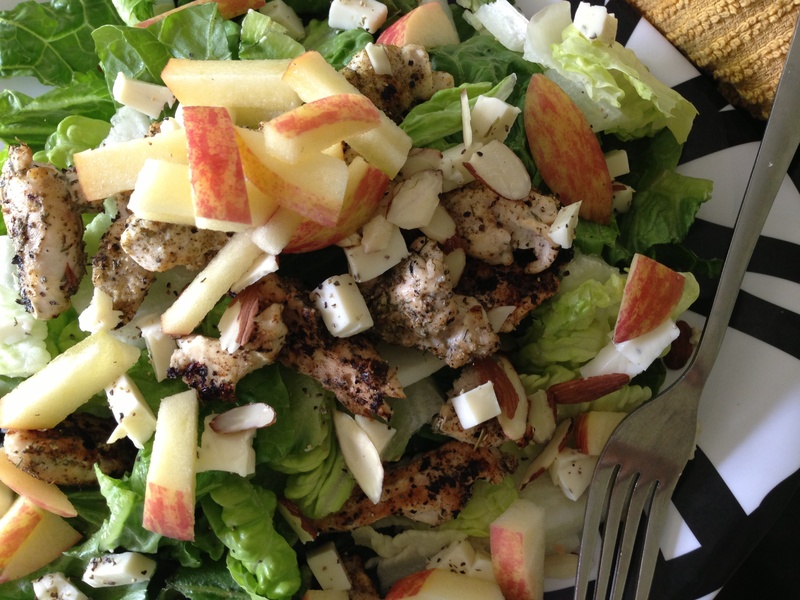 Like at-home fast food, but better. 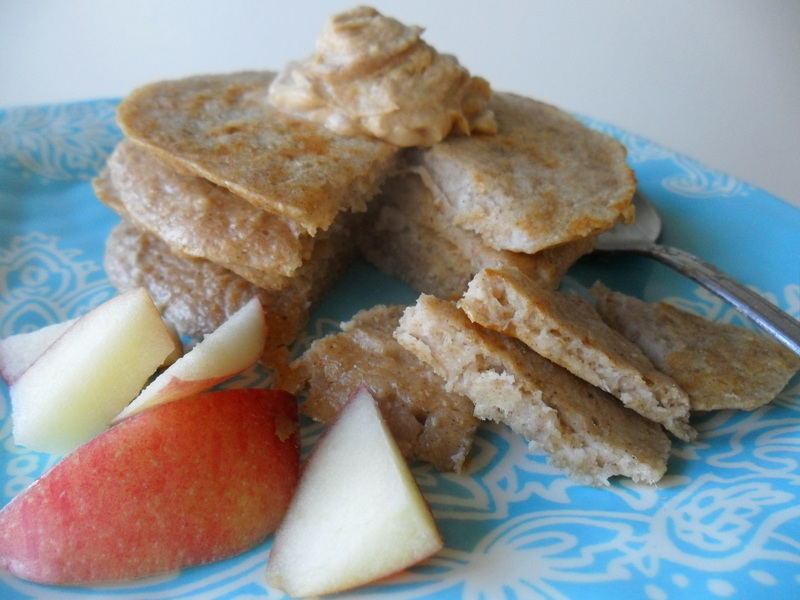 -Heat a griddle or skillet to medium-high. -While you wait for the griddle to warm, assemble the quesadilla. Divide cheese into two parts. 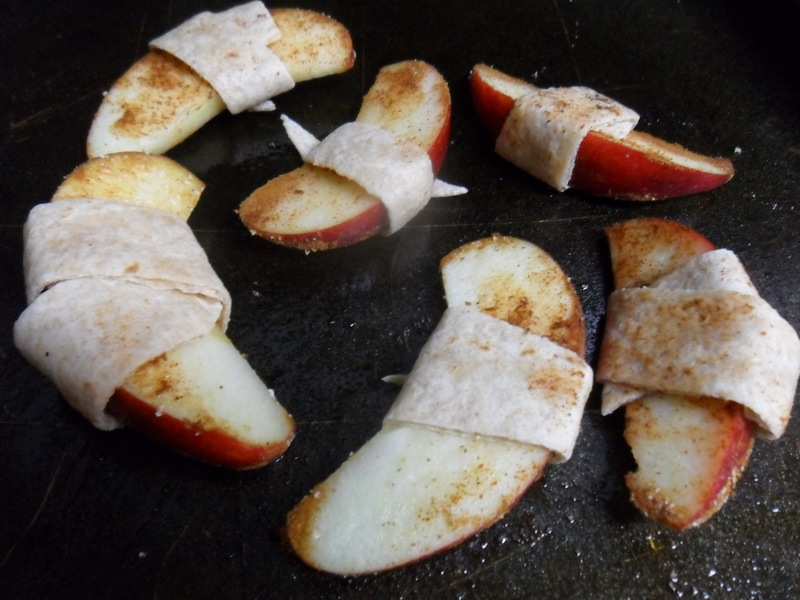 Create a thin layer on one half of the tortilla. 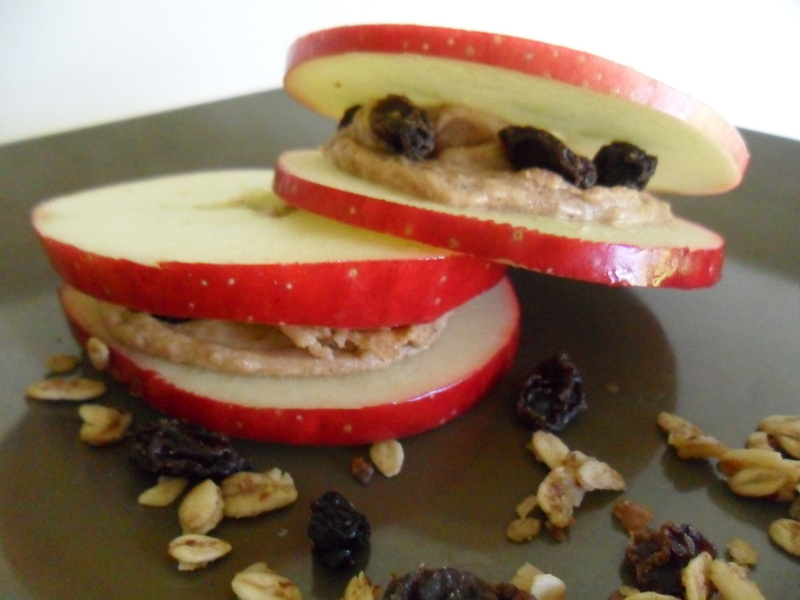 Then layer a few apple slices. Smear mustard and season as you like. 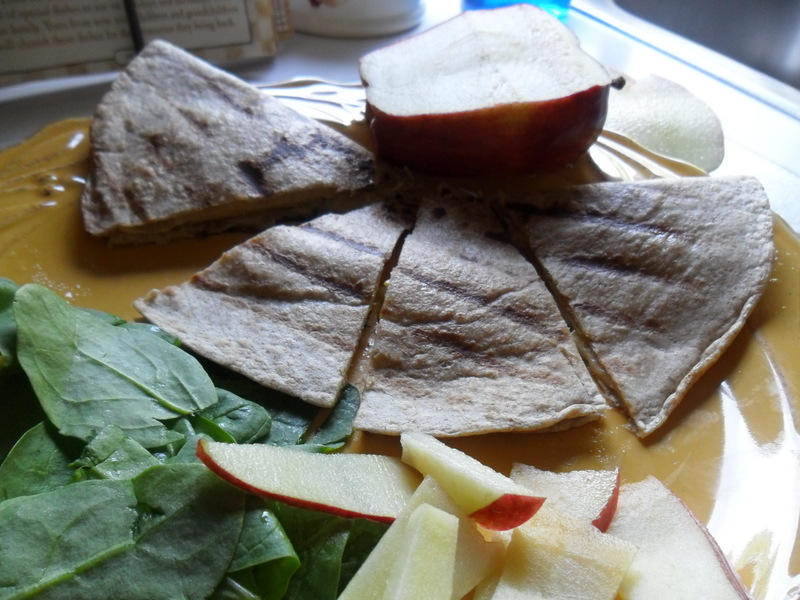 Add anymore apple slices you’d like, but not too many or the quesadilla won’t close. Layer the rest of the cheese on, and fold in half. -Coat griddle or skillet with cooking spray. Then, carefully transfer quesadilla. Let the first side brown and the cheese begin to melt a bit before turning over. Let the other side brown for about the same amount of time. Time will vary greatly depending on how hot your burners get, but mine only took about 3 minutes on each side. 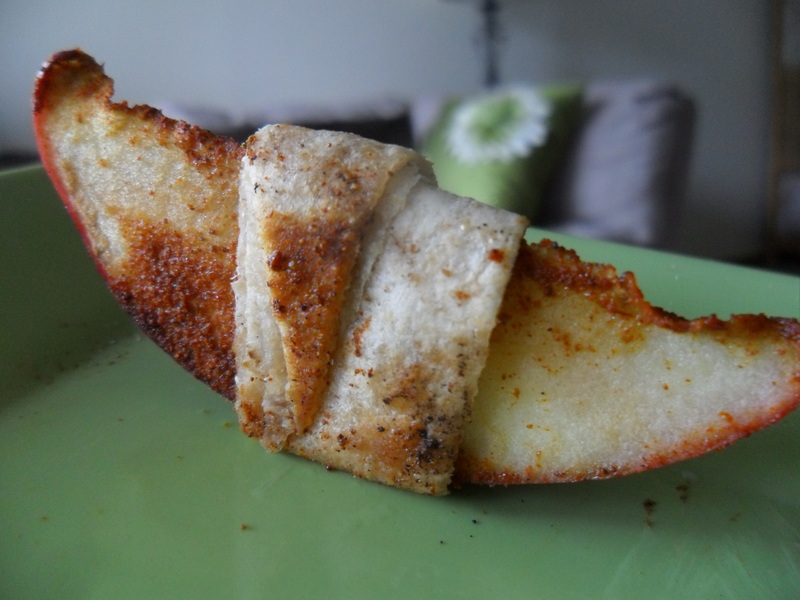 -Carefully remove and slice into quarters. 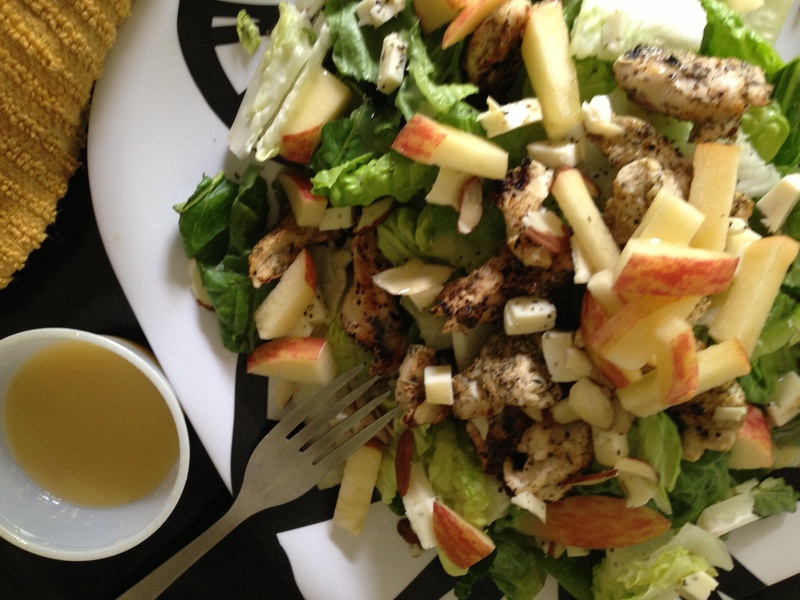 Serve with fresh spinach, extra apple slices, or a dipping sauce of your choice.